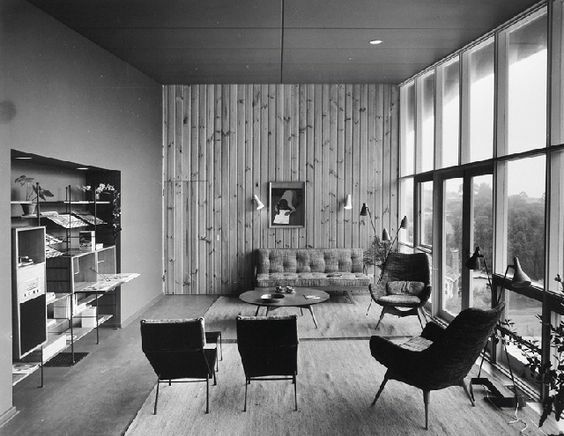 'The Age Dream Home', Melbourne 1955 with furniture by Grant Featherston. Shot by Wolfgang Sievers silver gelatin photograph studio stamp verso 39 x 50cm, Leonard Joel Auctions, Calender, Australian Auctioneers. A talk by author, Geoff Isaac, about his book ‘Featherston’; about Grant Featherston and his 30 year career in chair design. Grant Featherston is best known for his plywood Contour chairs developed in the early 1950s. However the Contour series just marked the start of a thirty year career in chair design. Working with Melbourne -based manufacturer Aristoc Grant, later joined by his wife Mary, designed hundreds of chairs some of which were so commercially successful that it is no exaggeration to claim that nearly everyone over thirty in Australia has sat on a Featherston chair.